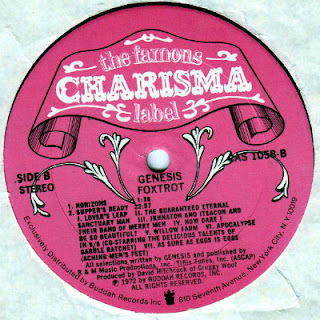 Genesis' Foxtrot. What's the problem with the reissue? Discussion in 'Music Corner' started by disraeli, Mar 3, 2015. As I hear it the UK has partly too much treble and no real bottom. Not very bad but I though the US (which I sadly don't have anymore) sounded more even with better foundation. What are the stampers on your Mad Hatter? I'm about to purchase this early UK copy of Foxtrot. The seller says it's in NM condition, and I trust the guy. The question is: what year was this released? The label is identical to the 1st pressing and the deadwax has the "PORKY". How about the SQ of this reissue? It says B&C. Isn't that the 1972 First pressing? It's an early pressing, but not the first. At least, that's what the seller is telling me. Oh ya, First Press should have A1 and B1 in the deadwax? Does it say PORKY on one side and PECKO on the other? I was under the impression that was the first pressing. Can’t see your image but as long as it’s a large mad hatter label and says distrbuted by B&C, it’s certainly an early one. Maybe it's a first vinyl and not a first sleeve? There are one or two differences in sleeve, should have the red spine text and red company inner with adverts I believe, although I'm not with my collection today so can't double check. According to that page, it IS the 1st UK pressing. B&C + spindle hole through the bow tie should seal the deal. I'd love to know if I'm wrong though. Pretty sure that is the first pressing. There's the same issue on "Trespass" ("White Mountain") with a complete verse being an alternate take. ...BTW, what does the expression can-utility mean? I can't find a (real) translation or an explanation anywhere?.. A play on King Canute? "Crisp cymbals". That's a warning sign for me. yesstiles, danielbravo, LivingForever and 1 other person like this. Looking at a Foxtrot Rhino remaster 2008 ($25)and a German repress 1978 ($16) both NM. Any opinions n those 2? 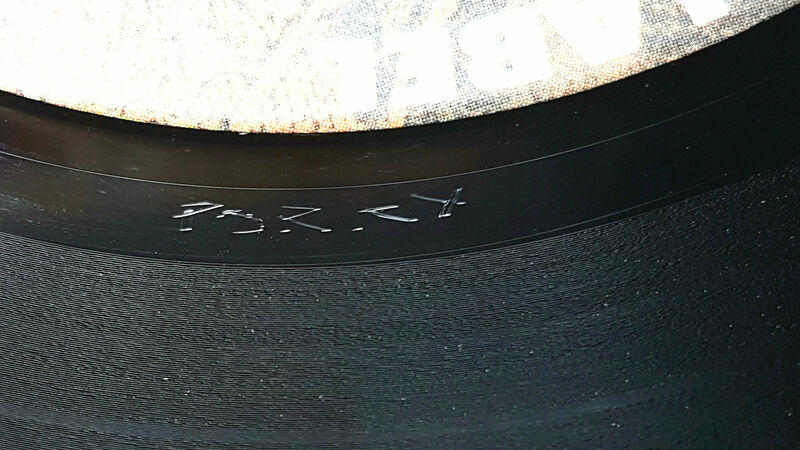 What's the difference between "Porky" in the deadwax and "Porky Prime Cut" in the deadwax for those UK First Pressings? Reissue (Classic Records) sounds great. Blows the original out of the water. And been out of print for about a decade now. Also costs a mint to buy on the secondhand market. Otherwise, yes, Classic Records were a great thing. On a wider scale, Genesis didn't sound right for a long time into their career. Their early releases were as muddy as hell, and it wasn't until I picked up the CDs that I could really begin to put aside the limitations of some of the vinyl. I used to collect the albums for years, and it was a job finding decent sounding ones. Looking through Genesis threads and saw this, didnt you score a US Pink Scroll Foxtrot recently at Open Mind? How do you like it now? Hi Leo! Yes I did and I do like. Keeping the UK 1st of course, but for listening it'll be the US from now on. Was there anything confirming as to why alternate takes were used on the remixes? Perhaps missing sections of multitracks which results in having to use alternate takes? I am also a fan of the US pink scroll of Foxtrot.......listening to Supper's Ready at the moment, and sounds fantastic. 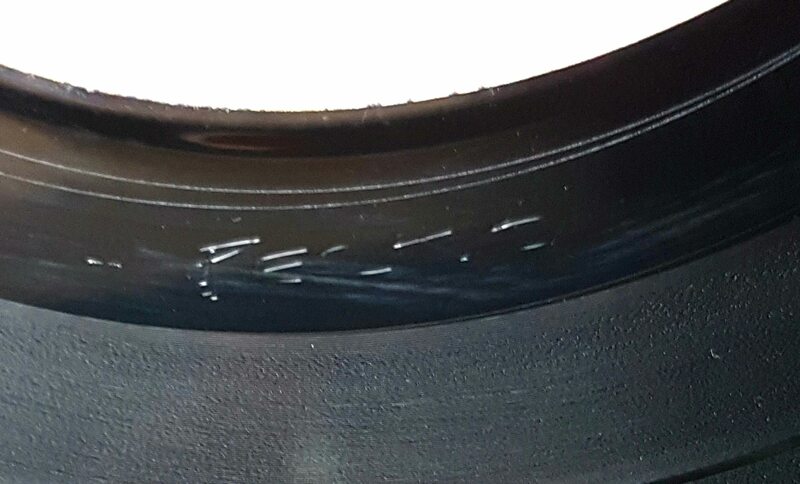 Does any one has detailed comparison of the tape error in Suppers ready on all three cd version. I have DE remaster on CD and i must say although it is said to be fixed there i can swear that i hear something changing in the mellotron just before the guitar/flute intro starts. Was it even more severe on the unremastered pressing? On 2009 remix i cant here anything in that spot.